One affliction of fish seen mainly in public aquariums (and a few larger home aquariums) is “eye-droop” in the Osteoglossids – the bonytongues (Arowanas and their relatives). Basically, one or both of the eyes of the fish begin to point downwards, as if the fish was scanning the floor of the aquarium below it. This symptom is chronic, and rarely if ever resolves on its own, and sometimes gets worse over time. The eyes become “stuck” due to looking down for food. Fat deposits behind the dorsal orbits of the eyes. High general stress levels in the fish. Keeping the fish in tanks with clear sides. In my opinion, numbers 5 and 8 cause the problem in most, if not all of the fish that I have had direct experience with. In fact, these two causes are actually related to each other; droop-eye seems often to result from mechanical damage when the fish runs into the sides of the tank or the lid. Arapaima with drooping left eye – notice the damage to jaw on the same side – indicating mechanical injury was likely the cause. One reason I feel that mechanical damage is a likely cause is due to the number of fish I’ve seen in which only one eye is affected. One would think that diet, inbreeding, light, stress, etc. would affect both eyes about equally, and there would be few, if any cases of single eye-droop. Finally, I have first-hand knowledge that it was caused by trauma in one case with an Arapaima. We had one on exhibit that had no problem with its eyes. About a year ago, I saw it crash into the tank wall when it got spooked by a pacu. Later that day, its left eye was drooping. As of today, it still has the eye-droop in the left eye, while the right eye is still fine. 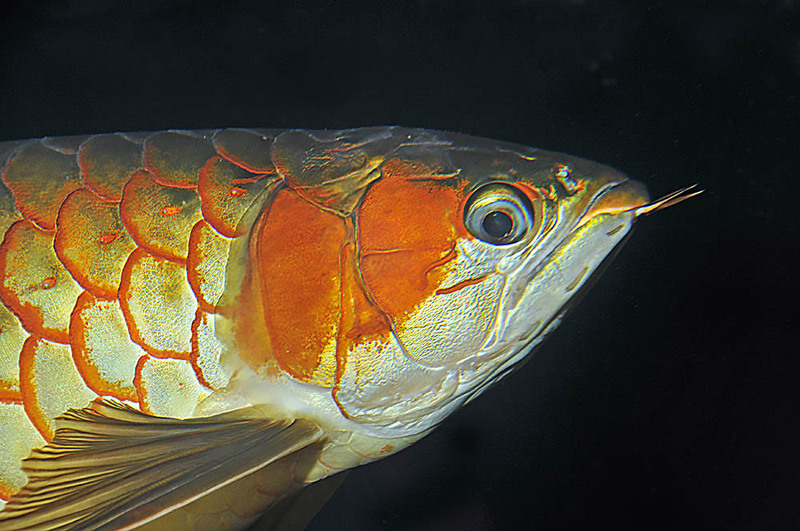 We have a very nice red Asian arowana that had been a long-term captive at another public aquarium. At some point while it was here, it developed a slight droop in its right eye, but the situation has been stable since then. One would think that if the cause was one of those like “fat deposits” or stress, that the issue would be progressive, and would have affected the other eye at some point. Finally, my problem with the inbreeding explanation is why then is the syndrome seen in wild collected fish as well? 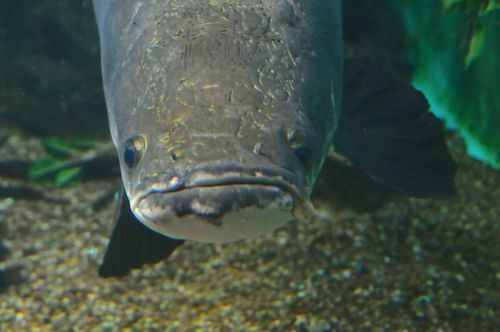 Public aquarists have long known that big arapaima and arowana become “flighty” at night. I subscribe to the belief that all we are seeing is mechanical damage from smacking into the tank walls or lids. Same thing may be the cause of the “daffy duck” syndrome in big pimeloidid catfish (where their bills get bent up, down or askew). It all has to do with a combination of tank size, fish mass, instigating factor and if the tank has clear sides or not. Small fish don’t have the body mass to hit the wall with enough speed to cause droop-eye. Big fish in really small tanks might not have enough running room to get up enough speed to cause damage. Big fish in big tanks can reach enough speed to die outright from hitting the tank sides at night (this has been shown in subsequent necropsy of young adult Arapaima) My idea is that some of the fish in the “middle” have just the right combination of body mass and “running room”, and get damaged when they hit the tank side, and their eyes droop as a result. In mild cases, one eye droops, in severe cases, or in cases of multiple impacts, both eyes are affected. Many people have reported that when kept in ponds or pond-like tanks, the problem is not seen. We have a walk-through rainforest exhibit with a shallow stream in it and silver arowanas don’t develop the problem in that system either. My theory is that the fish can more naturally navigate in ponds and streams, and can better avoid “hitting the wall”. Some “cures” have been suggested over the years. One interesting suggestion is to float red ping pong balls (why red?) in the aquarium. The idea is that the fish will turn its eyes upwards to watch the floating ball, and cure itself. Many Asian arowana breeders advocate moving the affected fish to outdoor ponds. I think this goes along with the observation that these species rarely if ever develop eye-droop while kept in ponds. There are also a few reports of surgery being performed to correct the problem, but as tantalizing as this sounds, there are never any details as to how such a surgery might be performed. That all said, there was a recent report from a British aquarium in which necropsies showed fat build-up (steatitis) behind the eyes of affected fish. I’m not sure of their sample size, nor if non-affected, long-term captives were also examined and if they were indeed “fat free”. Still, because that is the only true professional study of this syndrome that I’m aware of, I’m inclined to leave “fat deposits” in the mix as a possible cause, for now anyway.